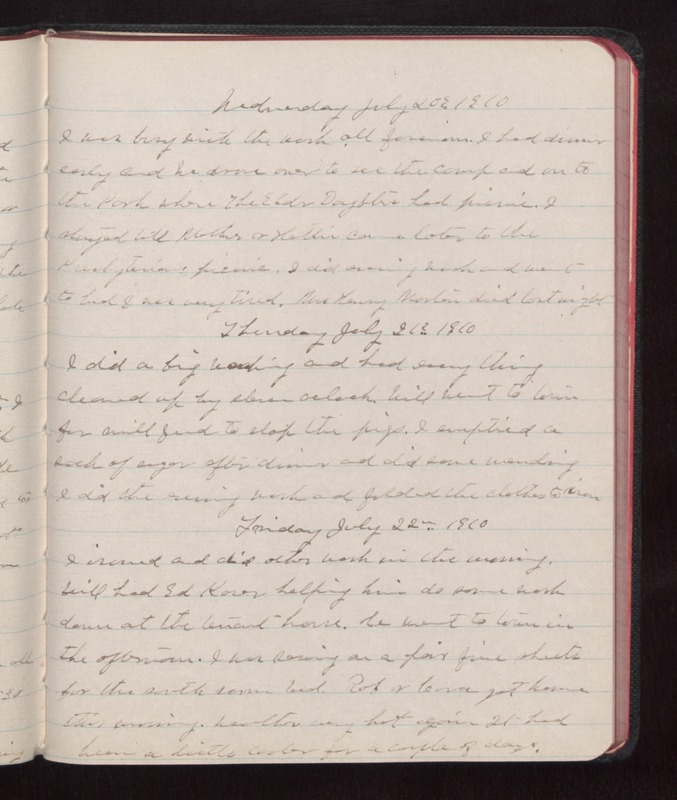 Wednesday July 20 1910 I was busy with the work all forenoon. I had dinner early and we drove over to see the camp ad onto the Park where The Elder Daughters had picnic. I stayed with Mother & Hattie came later to the Presbyterian picnic. I did evening work and went to bed I was very tired. Mrs Henry Morton died last night Thursday July 21 1910 I did a big washing and had everything cleaned up by eleven oclock. Will went to town for swill feed to slop the pigs. I emptied a sock of sugar after dinner and did some mending I did the evening work and folded the clothes to iron. Friday July 22 1910 I ironed and did other work in the morning. Will had Ed [Kever?] helping him do some work down at the tenant house. We went to town in the afternoon. I was sewing on a pair fine sheets for the south room bed. Rob & Cora got home this evening. Weather very hot again. It had been a little cooler for a couple of days.